This is the main entryway into the stadium. It is nice, clean, new looking - inaugural season was in 2010 - so it is new. I wandered down the pathway to the right of this entryway and accessed the stadium beyond the first base line. Fuzzy photo. The bullpens were beyond the field behind the outfield walls. The seats were in the shade which was quite a relief on this hot afternoon. Plenty of leg room in the seating area. An upper level for the officials and suite owners. Wide open concourse to obtain views beyond the stadium. 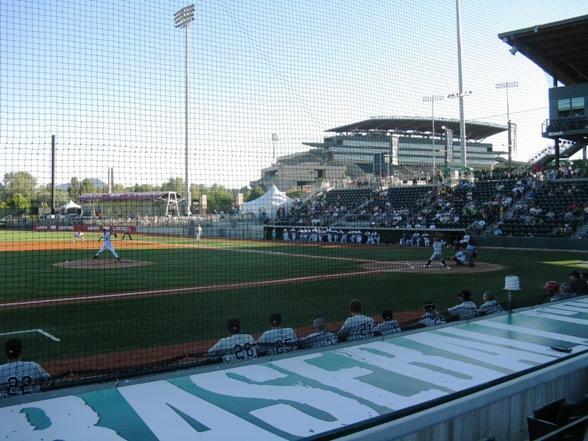 Here you can see the dugouts for both the home team (first base) and visiting team (third base), the net obstruction, and Autzen Stadium beyond the first base side. 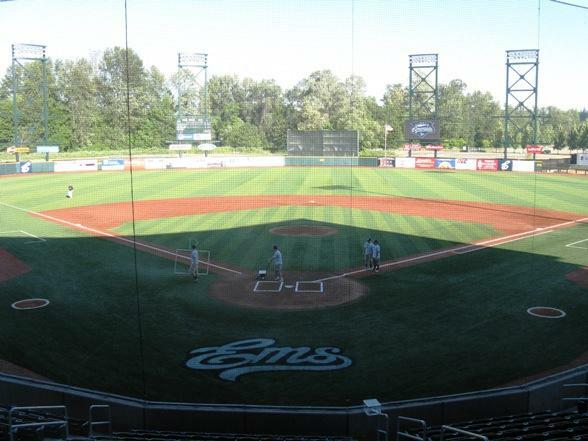 An alternate name/logo for the Emeralds is the Ems (painted behind home plate above). It was a lovely evening and it was safe to walk back to the hotel I stayed at. Excellent! Friendly and very helpful ushers, ticket sales, and even ticket takers/security. At first I thought it was fine but that didn't last. There is music and noise between almost every pitch. Ugh. Music is played during the announcing of the pitcher changes causing fans not to hear the name of the pitcher. Alcohol Monitor person (as I write this I realize this stadium is also used for the University of Oregon games, so I get it). 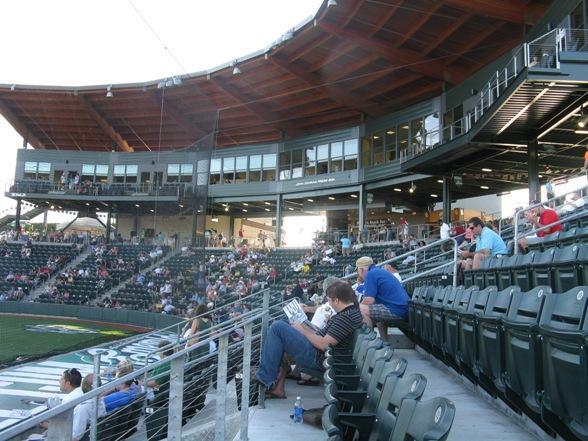 But is such a position needed for a minor league baseball game? Starting line ups not posted on a whiteboard but are printed and given as handouts. Check at the customer service desk. This hotel is walking distance to the stadium and a hotel I would recommend. Added 8/12/11. I don't do it often enough but special thanks to Chris Creamer for logo images. His site.